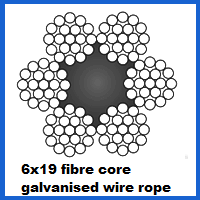 Positioned around the midpoint of our 6×19 galvanised rope line up in terms of thickness and strength, this 10mm 6×19 Galvanised Wire Rope product is resistant to rust, features a fibre core and is available either on its own or combined with fittings of your choosing. The structure of this rope is cleverly put together to create a configuration which is sturdy while still being lightweight. This is evidenced by the fact that it weighs in at just 34.6kg for every 100 metres of rope, yet has load limits of up to 6,134kg available. The fibre core is what makes this possible, with the galvanised steel wire bundles wrapping around it to create a corrosion-free exterior surface. 10mm wire rope in this 6×19 configuration will be even more effective if you order it as part of a custom assembly. We can put everything together for you and make requested adjustments to create the right wire rope setup for your needs. Our range of other products is extensive and includes alternatives to galvanised rope, such as stainless steel rope. We even stock specially adapted rope options, such as theatre cables and wire rope socks of various shapes and sizes. You can get in touch and place an order with us through a number of different channels. A quick call to 01384 78004 is a good option for getting a question answered or receiving a quote immediately. Emailing us is also a straightforward was to place an order. 10mm 6x19 Galvanised Wire Rope Overall rating: 5 out of 5 based on 6 reviews.